Here we will tell the story of the beginnings of our choir and how we became what we are today. First of all we would like to thank you for visiting and willing to look in our web site and the contents of it . Please come again in the future to check out our web site. The Taman Rimba Choir Ministry was found in the near 90's by the catholic christian family of Taman Rimba and was joined by thier son's and daughter's or also called our seniors . In the middle of 80's the first choir that was ministrated was the Taman Rimba Caroling X'mas Choir . Until now the Carolling Choir has many kids to support the choir and we thank God for those kids . 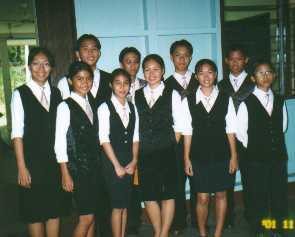 Then , in 1999 in late May the Taman Rimba St.Mark's Church Choir was ministrated and was joined by the youth's of Taman Rimba until now . But until this day , some of the youth's have gone to thier further studies left us with only approximitly about 15 youths to serve the choir in the church . But not to worry , although they have gone to thier further studies , they still coming back often to support the choir . With each challenge we have encountered, we became stronger in our faith. We may provide links to other sites that provide more detail on our choir history or particular events in our past. We invite you to become a part of the choir today and a piece of its history tomorrow.